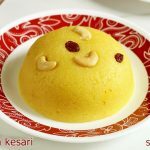 Rava kesari recipe – A quick South Indian dessert made of semolina, sugar, ghee and nuts. This recipe will yield you delicious, flavorful, soft and fluffy rava kesari just under 25 mins. 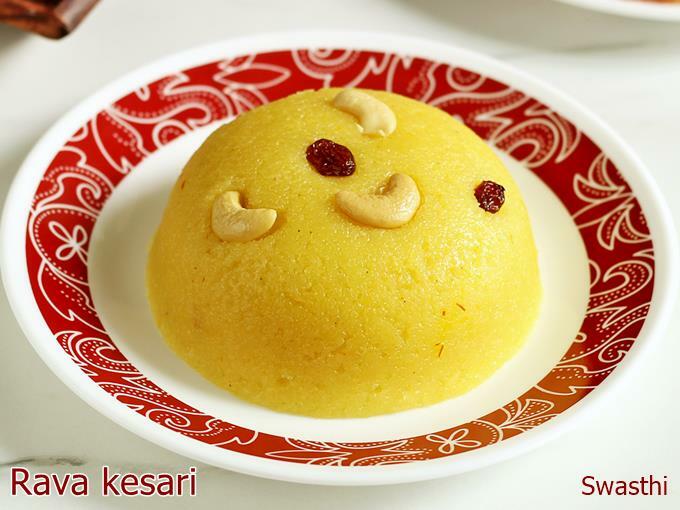 Rava kesari is a popular sweet dish from South Indian cuisine made of rava or suji, ghee, sugar, kesari and nuts. 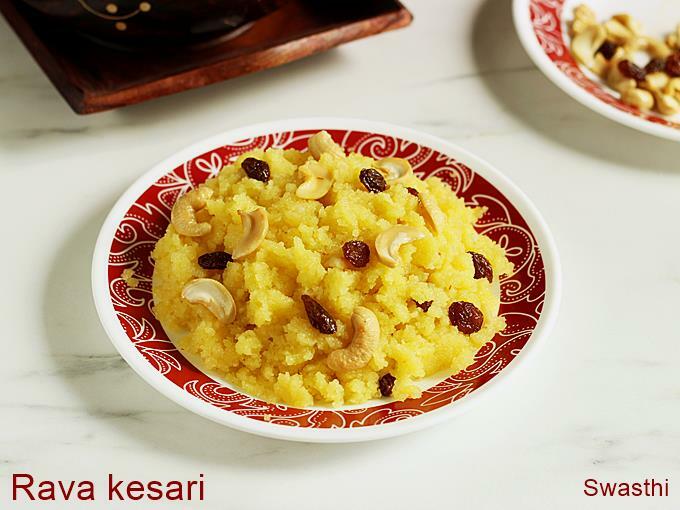 Rava means semolina and kesari means saffron color, the key ingredient that brightens up the dish. It is made often in most house holds due to its simplicity. It is eaten as a breakfast dessert or as a after meal dessert. This is most commonly offered as naivedyam to the Hindu gods or deities during pooja, festivals & auspicious days like Ganesh chaturthi, Navratri, krishna ashtami etc. Rava kesari is similar to the North Indian Suji halwa. In some parts of Karnataka and Maharashtra this is called as Sheera. But these are made without color. Another variation of the rava kesari is the karnataka kesari bath. This is a popular dish served in tiffin centers of karnataka. It is pretty much served in a meal platter & in a breakfast platter. Chow chow bath is one such platter where khara bath & kesari bath are served with coriander coconut chutney. This rava kesari is made without any unhealthy food color, a fat pinch of saffron has been used. If you do not have saffron, you can use natural edible color. How to make best rava kesari? 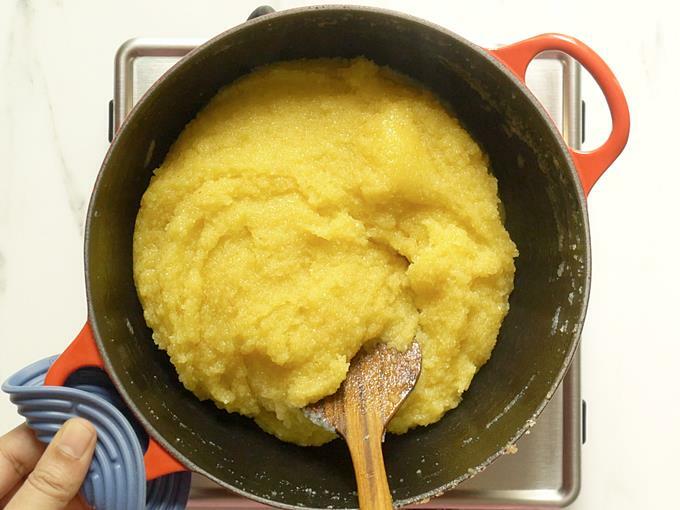 The key to making best rava kesari lies in the ratio of rava, water and ghee. The proportions shared below yield soft, light and fluffy kesari that isn’t too greasy. Roasting rava in ghee until slightly crunchy and aromatic is also important. This prevents the dish from turning sticky and makes it really delicious. Stirring consistently while pouring water to the rava is very important as it prevents lumps. 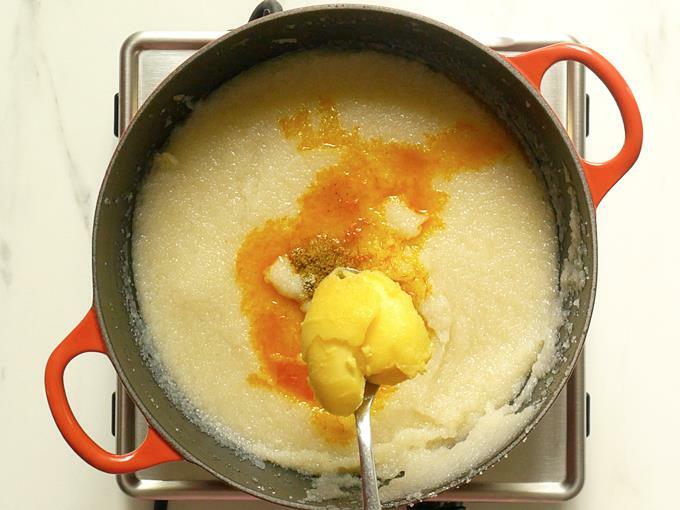 Originally rava kesari is made with fine semolina known as bombay rava. But many households now a days even use golden fine wheat rava or fine bansi rava to make this. 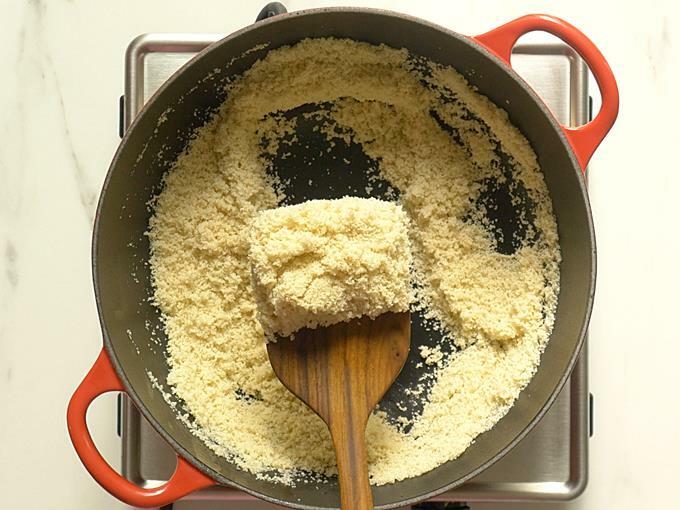 The flavor of the one made with whole wheat rava is different from semolina. If you prefer to use the whole grain rava, then use 3 cups water. 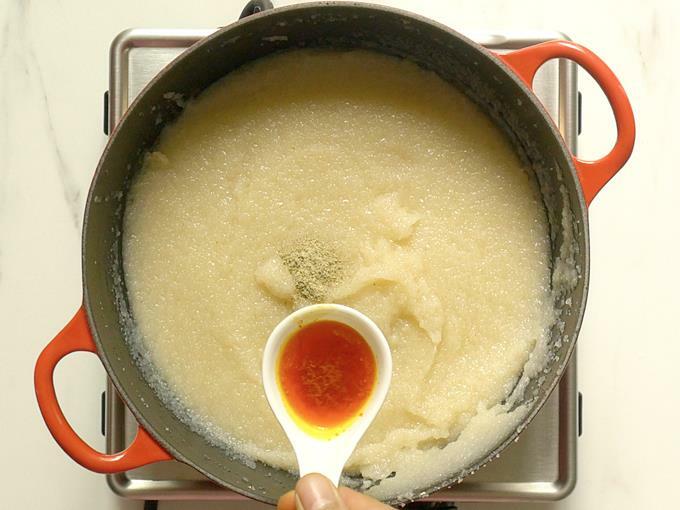 Can you use milk to make rava kesari? Yes, milk can be used instead of water. I personally prefer to use half water and half milk. Using only milk makes the sweet heavy. Rava kesari is a popular south Indian breakfast dessert made of semolina, ghee and sugar. Rava meaning semolina and kesari refers to saffron color. Rava kesari is flavored with cardamom powder. 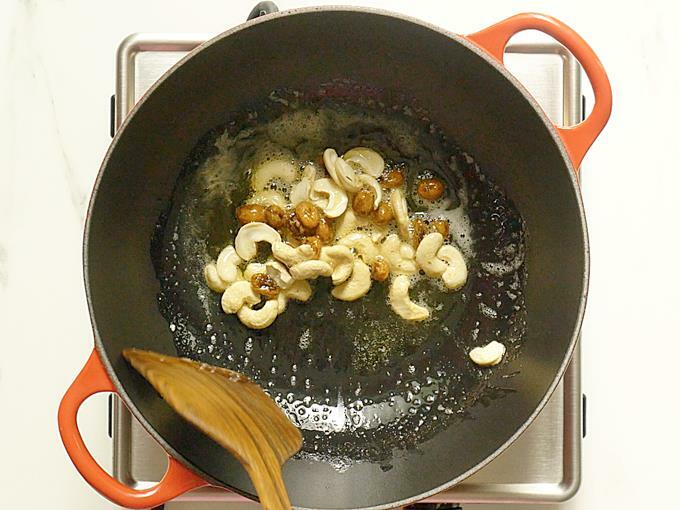 Heat 2 tbsp ghee in a heavy bottom pot and fry cashews until light golden. Then add raisins and fry until they swell up. Remove to a plate and set aside. 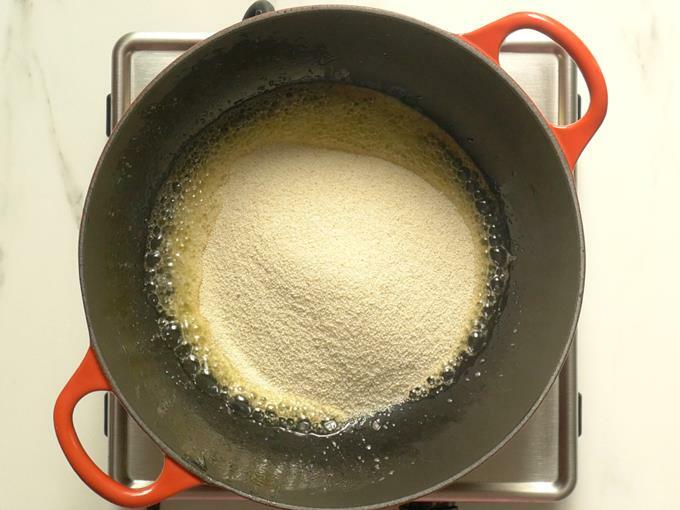 In the same ghee add the rava and fry on a low to medium heat until aromatic and crunchy. Do not brown or discolor the rava as the aroma of the rava kesari will change. While the rava is getting roasted, pour water to a pot and bring it to a boil. When the water turns boiling hot, slowly pour it to the rava by consistently stirring to prevent lumps. 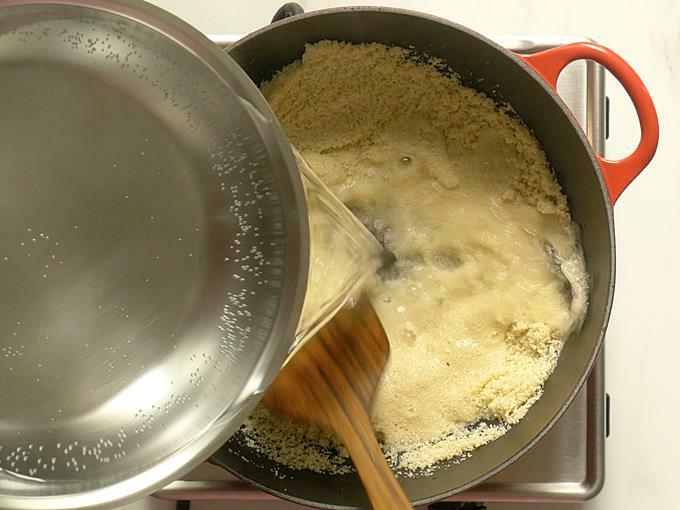 The water will be absorbed by the semolina soon. Keep stirring and make sure there are no lumps. 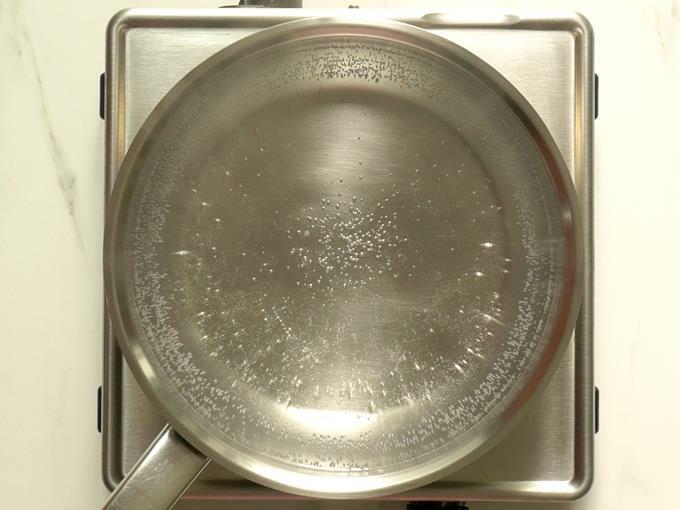 When you see there is no excess water in the pan, then cover and cook on a low flame for 2 to 3 mins. This is just to ensure rava is cooked completely and turns fluffy. Add sugar and mix well. Sugar will dissolve and the entire rava kesari mixture turns gooey. Keep stirring and cook until the mixture thickens and the moisture is evaporated. Then sprinkle cardamom powder, saffron or kesari and ghee. I used about 3 tbsps ghee. Mix well and cook for 2 to 3 mins until the rava kesari leaves the pan. Cover and rest for 2 to 4 mins. Grease a mould or round cup and then scoop some rava kesari to it. Level the top. Invert the bowl or mould to a plate. Gently shake off. Garnish rava kesari with cashews and nuts. You can also fluff up the rava kesari with a fork to make it fluffy. How much water to use for rava kesari? Most people prefer to use 2½ cups water. Usually rava or suji absorbs about 3 cups of water for 1 cup of rava to yield a soft kesari with a mouth melting texture. 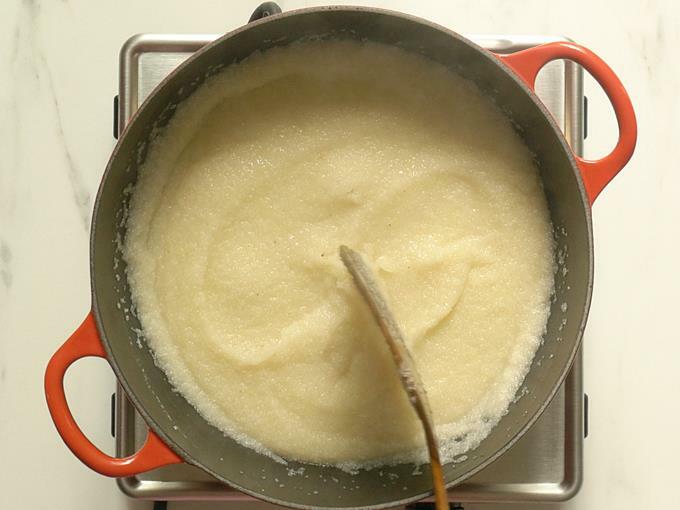 Using 3 cups will give a melt in the mouth texture but make sure to use enough ghee as mentioned in the recipe. Do not reduce the ghee otherwise rava kesari will turn sticky. 1. Heat 2 table spoons of ghee in a heavy bottom pot. 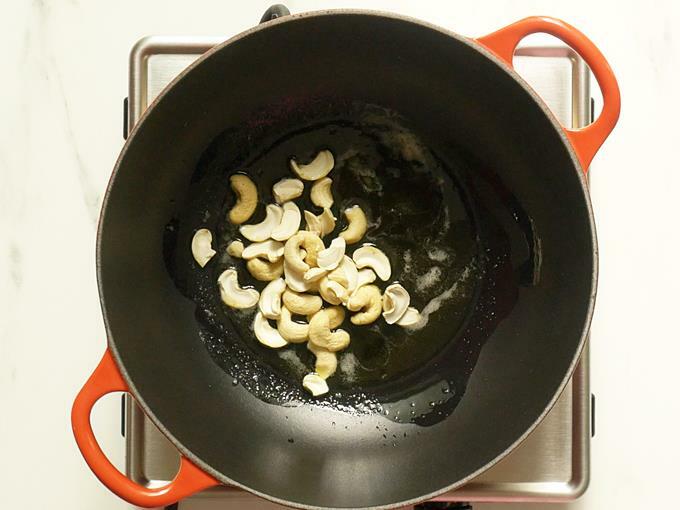 Fry cashews until slightly golden. 2. Add raisins and fry until they turn plump. Remove them to a plate. 3. Next pour the rava. Mix well to coat the rava in ghee. 4. Begin to roast the rava well on a low to medium heat until crunchy and slightly aromatic. Do not brown it. 5. While the semolina is getting roasted, bring water to a boil in a pot. 6. When the water comes to a rolling boil, pour it to the rava slowly in a stream. Stirring consistently with the other hand. Make sure the flame is medium at this stage. 7. There should be no lumps. 8. 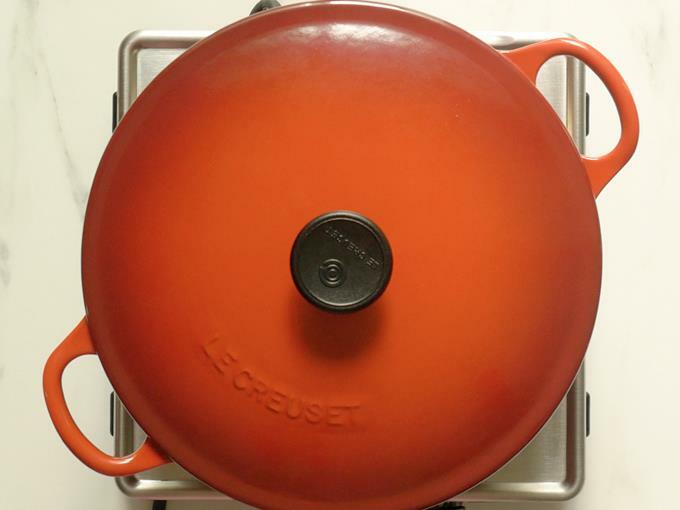 Continue to cook stirring consistently until the water is absorbed completely. 9. Lower the flame and cook covered for 2 to 3 mins. 10. Add sugar and mix well. Sugar melts and makes the mixture gooey. Then continue to cook until all the moisture evaporates. 11. Sprinkle cardamom powder and kesari color. I used 2 pinches of saffron soaked in 2 tbsps hot water. If you do not have the kesari, just skip it. 12. Next add 3 to 4 tbsp ghee. I used 3 tbsp. 13. 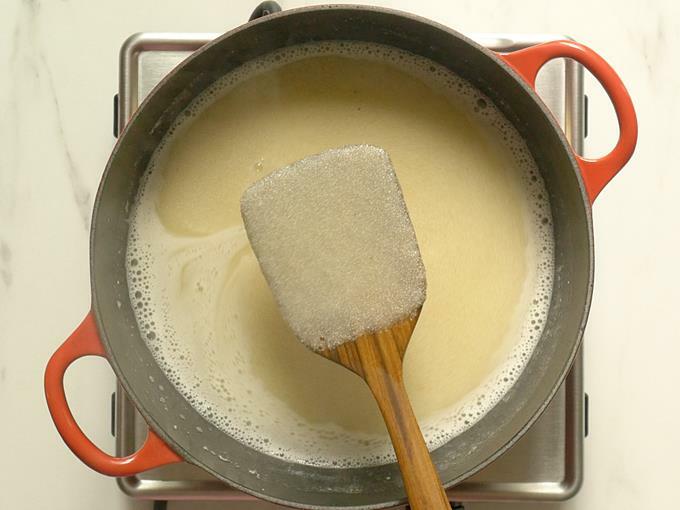 Mix well and continue to cook until the mixture leaves the pan. Cook covered for 2 mins. This is optional. 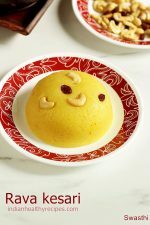 Garnish rava kesari with nuts and raisins. You can fluff up with a fork.